Wax Tablets, Chicken Rustling And The Medieval Roots Of The Modern University : NPR Ed Universities have changed significantly since the Middle Ages. 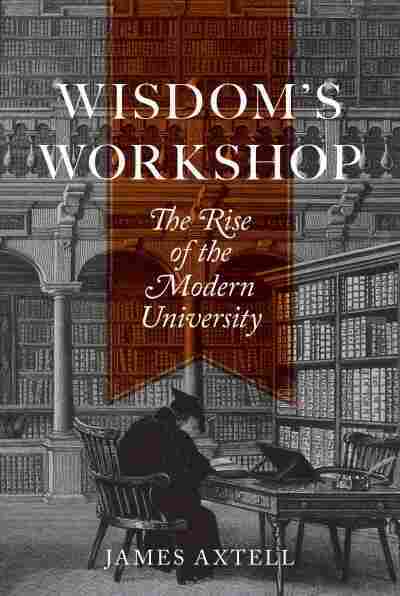 James Axtell describes just how far higher education has come in his new book, Wisdom's Workshop. 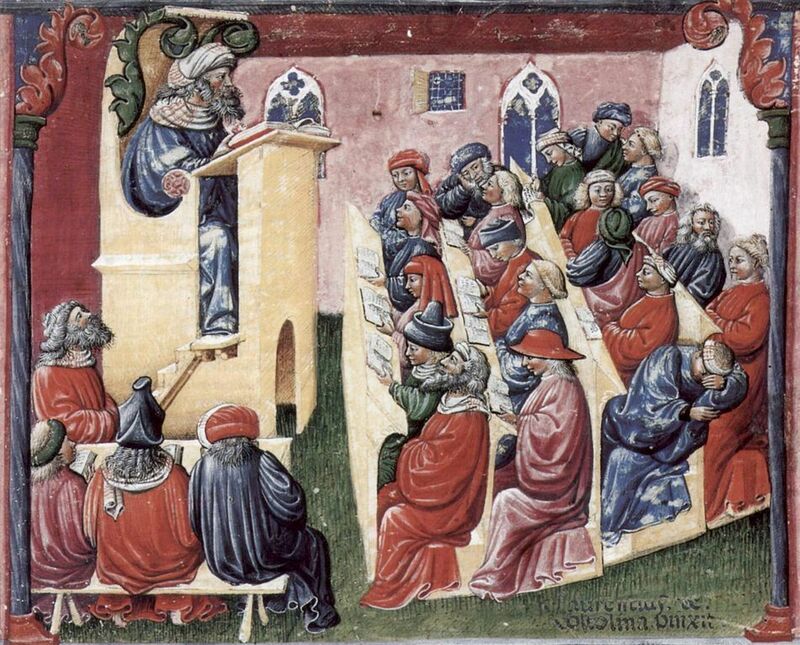 Students chat, nap and take notes in this 14th century lecture by Henricus de Alemania, painted by Laurentius de Voltolina. When we think of colleges, we imagine sprawling campuses, big-time sports programs, hefty endowments, and massive libraries stuffed with thousands of books. But the earliest universities were a little less grand. They were formed before Gutenberg invented the printing press, and before paper was universally available. Books were copied out by hand onto expensive manuscripts made from animal skins. Students would take notes — not on iPad tablets — but on wax tablets, small wax blackboards they could scratch marks into with a stylus. If they couldn't afford a textbook, they would write their own versions from lecture notes on cheap parchment after class. Or, they'd just go without. That's what higher ed was like during the Middle Ages, as James Axtell tells it in his new book, Wisdom's Workshop: The Rise of the Modern University. Axtell traces the U.S. university system all the way back to its medieval roots. It turns out universities have changed quite a bit in the last eight centuries, both in form and function, adapting to their times. And some shifts are just as radical as the ones we face today. Six hundred years ago, students couldn't just head over to the library and check out a book for reference. Before 1500, the largest Oxford library had 400 books, and most Cambridge college libraries didn't have more than 200. (And even after 1500, they kept burning books because of religious disagreements.) Libraries in France and Germany were a little bigger, because they got royal donations, but nowhere near the size of libraries today. And these were not the friendly, well-ordered stacks we know today. Libraries were uncatalogued collections, badly lit, with no desks or reading spaces. Because books were so valuable, they were chained to the lecterns, and often undergrads couldn't visit them at all. European collections grew after the invention of the printing press, but in the U.S., libraries were small and limited well into the 1800s. Students at Harvard and Princeton complained that their libraries were cramped, with no catalog and no ventilation. They weren't allowed to browse books or check out more than three at a time. And when European libraries started to grow? Some professors were actually concerned. There was suddenly "too much to know" and it was difficult to keep up. Early universities were not devoted to researching and publishing new ideas. They didn't need big libraries, because the kind of work they were doing didn't really require huge numbers of books. The "Truth," a mixture of biblical scripture and classical authors, was already known. It was just a matter of sharing it with future generations. Axtell explains that a lot of classes covered Artistotle, "since he writes on every subject, his books become the set books in logic and philosophy and metaphysics." The curriculum shifted over time (they added math in the 1500s, for example) but still stayed away from original research. American schools followed this model until early 1800s. German universities started producing original research earlier, and a form of the German approach was eventually brought to the United States. It really took off in World War II, when U.S. universities were given lots of government funding to promote research in the sciences. Today, getting into college can be a struggle. But back in the 1700s, it was the schools that were struggling to attract students. This meant that admissions standards weren't very high. You might have heard, for example, that Aaron Burr went to Princeton at 13 and graduated in two years. But while the average freshman was around 16, it wasn't unheard of for boys as young as 12 to enroll in college. Because students were so young, faculty had to act as parents, and there were strict rules — when students could be at meals, what time they had to attend chapel, as well as study checks and room checks and lengthy codes of conduct. They were also ranked, highest to lowest, according to a mixture of good grades and good discipline, with a dash of socioeconomic status factored in. The curriculum was also strictly prescribed. Unlike today, where new undergrads are swamped with a course catalog of choices, college students had a fixed set of classes with few electives. The shift toward older and graduate populations in the U.S. didn't happen until after the Civil War, when schools started to focus more on research. What About The Final Four? Unlike U.S. colleges today, with their giant sports industrial complexes, students at medieval universities were banned from jousts, swordfights and games. In the 1500s, English universities had bans on football, and, at some schools, students who engaged in athletics could be whipped. Even in the U.S., many colleges banned sports on campus until the Civil War, because administrators were afraid that students' concentration (not to mention campus windows) would be broken. Students still found ways of burning off all that energy — and today's fraternity hazings seem like child's play in comparison. In some medieval German universities, freshmen had their teeth removed with pliers, or were forced to eat pills made with horse or goat feces in anti-Semitic rituals. Cambridge students, in the 1500s, sometimes cut the upper lips or chins of freshmen students, after forcing them to chug salted beer. At American schools, students were punished for chicken rustling, throwing rocks at tutors' windows, burning down outhouses, dueling, wearing women's clothing, visiting brothels, and — goodness forbid! — using words like "dash" and "drat." Imagine sitting in the dining hall, complaining about homework and lack of sleep ... in Latin. University students were supposed to speak Latin, not just in class, but around campus in both early European universities and early American colleges. In medieval German schools, students were supposed to report fellow students who spoke in "vulgar vernacular," and undergraduate spies, or "wolves," were appointed to sniff out "vulgaristantes," who were publicly shamed. The Latin imperative lingered in Europe as late as the 1600s, in part because it was a language that all academics could speak in common. American universities had similar requirements. At Yale, the Latin speaking rule stayed on the books until 1774 (though it wasn't enforced). After Latin, the language serious American academics had to know was German. To get a Ph.D. before the Civil War, Americans had to go to Germany and write a dissertation auf Deutsch. At early universities, most students were middle class, with a handful of nobles. But there were some poor students, too. "They couldn't be serfs' kids or under some kind of dominant system," Axtell says. "You couldn't be owned by anybody else." Schools had scholarships for the "deserving poor," as well as work study-type programs (you could serve a richer classmate), and student loans. "It wasn't a total scot-free ride," Axtell explains. A university might forgo the cost of admission at first, but, "the schools would hope that they would make good later in life and repay it when they got a chance." And universities raised money in ways that are familiar today. U.S. colleges started asking alumni for donations as early as 1650, starting a tradition of annual giving. Within a few generations, U.S. colleges had their first lines of legacy students.